RPG fanatics have probably heard this tale before, but there's a bit of history behind the very first Star Ocean game. Back in 1995, a majority of the team that created Tales of Phantasia (which was released stateside on the Game Boy Advance back in 2006) left Namco due to creative differences. The team moved onto Tri-Ace, whose debut title was Star Ocean. One of the last games for the aging Super Famicom, the RPG pushed the console to its limits in terms of the cartridge size and graphics. The game even had limited voice-acting, which was unheard of (no pun intended) in those days. The question is, does this remake of the first game in the classic franchise have what it takes to stand out in the portable gaming market? We'll start with the gameplay, by far my favorite facet of SO: FD. Those who have played the sequel Star Ocean: The Second Story on the original PlayStation will feel right at home. As stated in my preview, the battle system is superb. Instead of utilizing a turn-based system, SO: FD grants each character the freedom to do whatever they please in battle. You still encounter enemies randomly on the world map screen and dungeons, but the fighting itself feels like an action title. 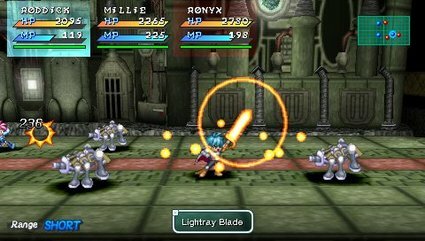 Basic attacks can be used an unlimited amount of times, while spells and techniques usage are limited by MP. The only interruption to the non-stop action is when magic or an item is being used – the game pauses for you so you can make your selection and there's a casting time where your character becomes vulnerable. The only gameplay problem I had was with the A.I. of your party members. The player can only directly control one character in battle. That leaves the other three in your party in the hands of the computer. You are able to direct the strategy of each party member with instructions like "Attack with all you've got," "Save your special arts!" or "Focus on healing friends!" These commands usually leave your party members with a one-track mind. They either go overboard using special techniques/healing and thereby wasting precious MP, or melee characters will fail to use a healing item and instead fight an enemy to the death. Luckily, you can assume control of any character during a battle and/or switch the commands given to the A.I.. However, in the heat of a difficult battle, the mistakes made by the A.I. may prove to be too great to patch up by the time you gain control of your characters. I also had few minor issues with the puzzles. They were fair for the most part, but a particularly obtuse one involving the phases of the moon took me a good hour to figure out. Some of the hidden locations you must visit in order to advance the plot are unmarked on the map screen, so you must wander aimlessly around a general area to find them, which quickly becomes irritating. The option to customize your character is another asset of SO: FD. 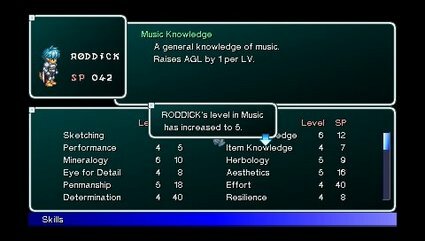 Each level up grants you skill points that allow you to give your characters different abilities. They range from stronger basic attacks or reduced cast time in battle to item creation. Each character has a particular affinity towards certain skills, but you are free to ignore those. While I feel these skill points are an essential gameplay element, the game allows you to ignore this aspect if you so desire. Your characters will still level up and the story will advance, but you'll be missing out on a good chunk of the game. Presentation is top-notch in my book. Each of the characters has been redrawn in a more modern anime style. I particularly applaud the art direction of the game: the 2-D sprites and pre-rendered backgrounds give the game a dynamic look without betraying its old-school RPG roots. Furthermore, new anime sequences are a sight to behold -- Production I.G is well known for their animation work and it really shows in the cutscenes throughout the game. Unfortunately, they are few in number and I was left wishing for more. 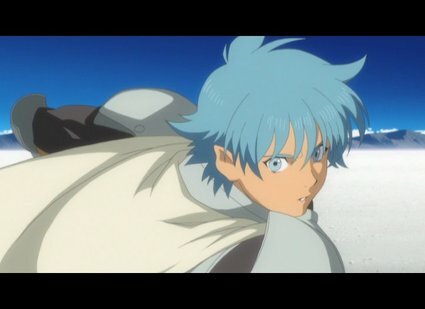 In addition to these anime clips, there are many plot-advancing story sequences, where a portrait of the character is displayed and there is spoken dialogue which relates the emotions experienced by the characters. Speaking of the dialogue -- given the nature of the script, the voice-acting in the game is adequate. The voice actors for Ronyx and Ilia in particular did an excellent job, as evident in the more dramatic sequences where they breathe some much-needed life into the trite dialogue. On the other hand, the soundtrack is decidedly average, if not simply unmemorable. In fact, after finishing the game, I am unable to hum a single tune from it. The only piece of music I can recall is the J-pop song that plays every time you begin the game. There is also some minor replay value associated with the game. Certain characters can only be recruited if others are absent from the party, meaning that you cannot find every single playable character in one play-through. Sequences called "private actions" are the game's way of allowing you to uncover additional background information on the plot, as well as hidden items or optional characters. Much like the skill points in the game, these "private actions" are completely optional and you can go through the entire game without viewing a single one. The plot is my biggest problem with the game. The story and characters are extremely bland by today's standards. Plot twists can be seen from a mile away. The blending of traditional fantasy and sci-fi elements seem awkward and forced. At one particular point early on in the game, the heroes are given a choice to join members of a space federation that just materialized in front of them, but they will never be allowed to return to their home planet. Granted, they are desperate to save their village from a deadly illness, but I am puzzled by their lack of any desire to bid their loved ones farewell. One of the biggest reasons I spend a large amount of time with an RPG is to advance the story. With SO: FD, there was simply never enough emotional depth in its plot for it to become a big incentive for me to continue the game. Lastly, purists will be offended by the name changes. Romanizations of the original Japanese names used in the fan translation have been replaced by more Western sounding names. Additionally, the names of two characters with emotions as their names were replaced with oronyms. Push comes to shove, JRPG fans will enjoy Star Ocean: First Departure. The game has a lot going for it: its place in RPG history, an engaging battle system and some replay value. Nevertheless, the game is weighted down by its age. The cliché-ridden story and one-dimensional characters is really telling of how old the game is. In the end, if one keeps in mind that SO: FD debuted over twelve years ago; you'll find yourself an enjoyable adventure on-the-go. Those unfamiliar with RPGs may want to pick up a more modern and polished title as their introduction to the genre.